An estimated 5 million dogs are slaughtered in Vietnam every year for meat, while an unknown number of cats are killed for human consumption as well. Many of these animals are stolen pets while others are sold to dog traders. There are dog meat restaurants all over the country, but they are concentrated mainly in the north. Cat meat is most commonly served in the north as well and these animals are shipped in horrible conditions from all over the country to be sold at restaurants there. Dog thieves are rarely caught and punished for stealing dogs as police do not bother with theft of property under 2 million Vietnamese Dong ($100 USD), but many pet owners have attacked dog thieves, beaten, and killed them. The lack of police action against dog thieves and the complete absence of legislation against the industries of cat and dog meat make it a volatile situation here for pet owners. 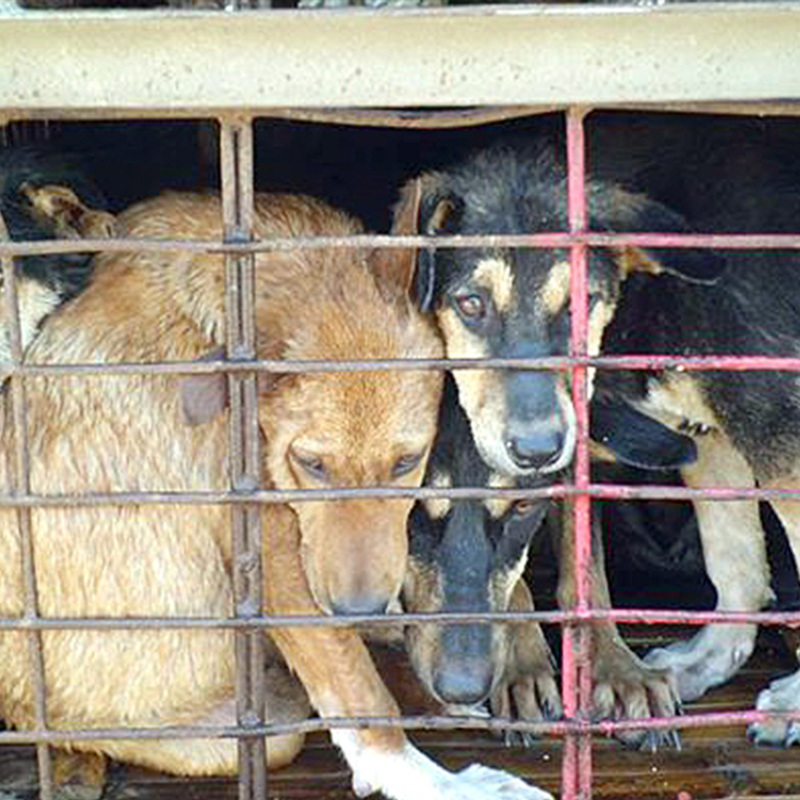 While many people unfamiliar with the political situation in Vietnam petition endlessly for a ban on dog meat, we fear this is not the right answer here in the immediate future. Vietnam’s lack of rule of law means any ban would not be enforced, much like most legislation, and even pushing that through the legislature would be nearly impossible without massive local support. The idea that international organizations, diplomatic channels, and petitions would ever hold any weight in Vietnamese government is simply unfounded. Regulating the industry would do nothing more than encourage dog farming as it has for animals considered as livestock. as there are laws prohibiting transportation of dogs across provinces without rabies vaccination certificates. Cat meat has been banned for over a decade due to a problem with an overpopulation of rats that had been eating the crops, but it is rarely, if ever, enforced. Both of these laws require an active local community that holds the police and department of animal health accountable to the existing legislation they are required to enforce. Since most agents and citizens do not know the law, they cannot hold the authorities accountable. Educating grassroots animal rights organizations and animal lovers around the country will help to bring these laws into enforcement. cat meat trade, but also to teach them about how to protect their animals from being stolen and killed. single dog and cat saved is valuable and deserves a better life. In the long term strategy for eradicating the trade, however, it is simply an unsustainable method given the sheer numbers of animals involved. It is extremely costly for organizations, financially supports the trade, and does not begin to address the problem of there not being nearly enough homes, funding, and human (veterinary and caretakers) and material resources for the animals taken from the trade. Many large organizations who are not vegan and support the trade in all other animal products are taking dogs from traders on trucks and in markets. While this may be a great way to get donations from the public abroad that knows nothing of the reality of the situation in these countries, it is not at all a solution to the problem if they continue to condone the violence against other species. It makes no sense to condone violence against some species yet condemn it in others. In our experience, these single issue campaigns run by major organizations in the animal welfare (NOT rights) community have done nothing but breed racism and ignorance in their loyal followers while using these dramatic rescues as media stunts to garner massive donations. Non-speciesist animal rights education remains our long term strategy in spite of the trend seen in much larger organizations. We look at the dog and cat meat trade as any other consumer product in addressing ways to stopping the market. First, we address supply through mass sterilization programs that reduce the number of unwanted animals roaming the streets or becoming pets that are sold or stolen for the trade. Addressing the value of pets as lifelong family members rather than disposable and replaceable nuisances goes a long way in getting pet owners to make changes to their routine and homes to take care of their animals better. It is the domestication of species for human use that has led to the exploitation of all these species- whether pets, farm animals, or wildlife- and it will be the discouragement of pet ownership and animal use in general that ends it. This is a very slow process, we know, but it is the solution that will be sustainable in the long term rather than the expensive and ineffective quick “fix” of buying from traders and slaughterhouses directly.